why not let GHR look after your experience? GHR Honda can provide varied levels of support for competitors looking to enter the Dakar Rally in 2013. Ranging from rental of a ready-to-ride Dakar spec CRF450X Rallye (including transport, full mechanical support and servicing) for the duration of the event, to basic mechanical, parts backup or personnel transport only, GHR can assist you in your efforts. 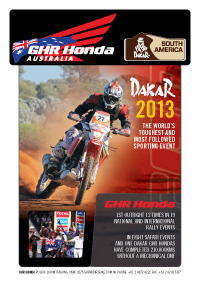 Click here to download the GHR Honda Dakar 2013 Support Package for more information. 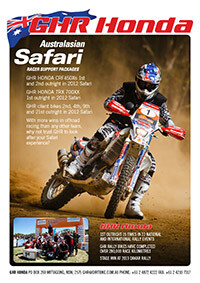 GHR Honda can provide varied levels of support for competitors looking to enter the Australasian Safari in 2013. Ranging from rental of a ready-to-ride Safari spec CRF450X Rallye (including transport, full mechanical support and servicing) for the duration of the event, to basic mechanical or parts backup only, GHR can assist you in your efforts. Click here to download the GHR Honda Safari Support Package for more information. GHR Honda can provide competitors with rental bikes for the Finke Desert Race. Choose from either the Honda CRF250R/X or CRF450R/X built to race specifications and set up with all the essentials. Package includes transport of race bike from Sydney to Alice Springs, return transport of race bike from Alice Springs to Sydney, use of motorcycle for test ride and race day. 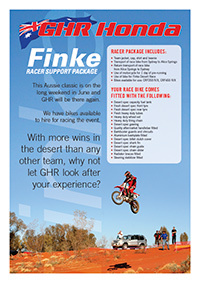 Click here to download the GHR Honda Finke Support Package for more information.